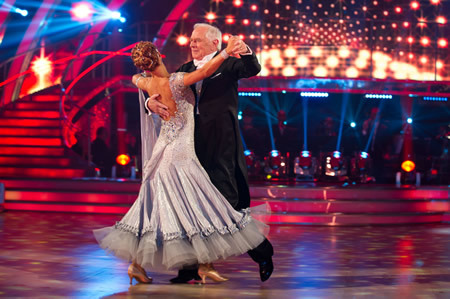 Johnny Ball became the first celebrity to leave Strictly Come Dancing after he and stand-in partner Iveta Lukosiute lost the dance-off with Richard Arnold and Erin Boag. Johnny, at 74 the oldest ever Strictly Come Dancing contestant, scored a 20 in his week 2 dance but still found himself in the bottom two after the public telephone vote. Craig Revel Horwood, Darcey Bussell, Bruno Tonioli and Len Goodman, all voted for keep Richard in the competition so it was goodbye to Johnny and Iveta. Richard Arnold went first in the dance off in his impressive shirt. Johnny Ball performed OK in the dance-off although he admitted he was nervous. He said that it was the worst dance he had done.